Hi - I get interference spikes at small regular intervals across the band scope - they show up as thin lines on the waterfall. I notch them out if they coincide with a signal I'm listening to. How can you get rid of them though? I have high density ferrite rings at various locations along the usb cable driving the sdrplay - the usb cable is as far from my pc as possible. Antenna is 40m long end fed with 9:1 balum - it pulls in strong sigs and only 20feet above the ground horizontal. No earth at antenna - but I do have an earth on outer shield on coax going into a plug socket. Doesn't make a difference though - any advice much appreciated? Last edited by mikebrock on Thu Jan 01, 1970 12:00 am, edited 0 times in total. Re: Ferrite and interference spikes? This seems to be a common problem and it's one I have as well, mainly between 30 and 60 MHz and again around 440/460 MHz. In my case, removing the antenna gets rid of them, indicating it's a local interference source. No amount of filtering or screening makes any difference. I think the advent of spectrum/waterfall displays has made the problem far more apparent than 'single frequency' receivers do - a screenful of stripes is far more alarming than a carrier every 100KHz on a 'normal' receiver! I have solved the problem - seems to have been a noisy usb port in my case. Simply changing the usb connection has completely removed those spikes. I will do a screenshot before and after later. The first image shows what it is now with usb connection relocated. My solution: the usb-cable I was using was perfect for connecting my Arduino Uno but not the SDRplay. I switched with an other one. Last edited by loewal on Thu Jan 01, 1970 12:00 am, edited 0 times in total. This post is partly to share my experience, and partly to seek advice before I start experimenting! To get started I'm currently using a whip antenna (Nagoya NA-771) screwed directly into the RSP, with that RSP on the end of a 5m USB cable to try to keep it away from the computer. This cable has a ferrite core, but only on the computer end. My initial interest is trying to detect meteors by the reflections they give of signals from a VHF transmitter which is too far away for direct reception, and I'm trying the Graves transmitter on 143.050 MHz, which seems to be widely used for this purpose. No luck yet! 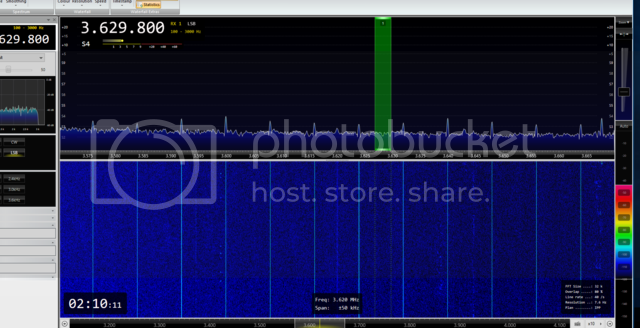 I too observe regular interference spikes in some bands, spaced exactly 8 kHz apart. I strongly suspect these to be due to interference from USB: I understand that the USB2 micro-frame length is 125 μS which corresponds to 8 kHz. 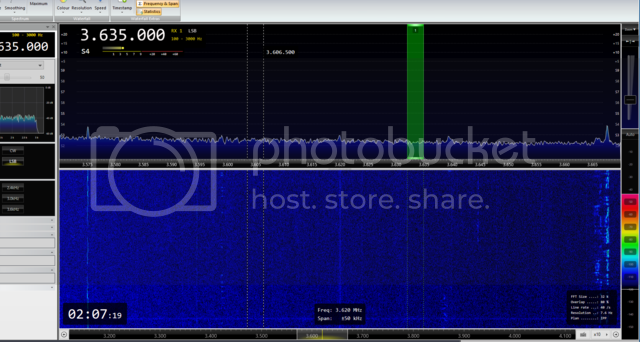 As corroborating evidence I also see a strong signal at 480 MHz, which is the USB2 clock frequency. I don't think the interfering signal is internally generated or coming in through the USB connection, because it disappears if I remove the antenna. I guess, therefore, that it's being radiated either from the RSP's USB cable or from other USB equipment, and picked up by the whip antenna. I could try adding ferrite cores to both ends of every USB cable in sight. Perhaps type 31 cores? Or maybe both type 31 and type 61 cores to cover all bases? I'm going on the information I found at http://palomar-engineers.com/ferrite-products/ferrite-cores/ferrite-mix-selection, but I freely admit I'm out of my depth a bit! I could try moving the antenna further away from sources of interference by using a length of coax. I could also try a narrower band antenna (e.g. a dipole tuned to 143 MHz). If anyone has solved these problems, I'd welcome some guidance, otherwise I'll have a play and report back if I have any success! Last edited by jpsa on Thu Jan 01, 1970 12:00 am, edited 0 times in total. If you want to detect meteors I recommend the FM broadcast band. During the 2014 Perseids meteor shower I received a number of bursts on 87.6 MHz on the whip antenna of a Tecsun PL380 portable receiver. We were out in the garden in the late evening and observing the shower visually. Best reception was a 30 second + burst of Arabic - from a North African station. Thanks, Dave... I'll give that a go too! jpsa wrote: ...I'll have a play and report back if I have any success! Adding ferrites to the RSP's USB cable definitely helped: I used Fair-Rite 'Material 31' clamp-on cores. What made bigger difference, though, was moving the RSP's USB cable to a hub, rather than plugging it directly into the back of the PC. Whether this is a difference in the circuitry of the two USB controllers, or just that it's a good idea to keep the cable to the RSP as far away from the main PC box as possible, I don't know. I've also found another comb of interference spikes at a 44.1 kHz spacing: I'm assuming this is from the (wired, not optical) S/PDIF connection from my PC to the HiFi. I'll try more ferrites (I need some to fit a slightly larger cable, so I've not done this test yet). This may be a never-ending quest! Perhaps the best fix will be to move the antenna to the other end of the house from all this electronics, and run quality coax from there.